“Warm Sunshine…Light Breeze…Laughter fills the air… These are all signs that the 30th Annual Virginia Wine and Craft Festival is just around the corner” (Wine and Craft Festival). Here in the Shenandoah Valley of Virginia, we like to celebrate spring, particularly when there is local wine involved in the festivities. If you’re a fan of wine tasting, arts and crafts, food vendors, live music, and warm, springtime weather, then you’re in for a treat on May 21, 2016. Every year in historic downtown Front Royal, VA, a number of local wineries congregate to bring you some of the best libations that their vintners have to offer. This year you can expect to taste various vintages from Peaks of Otter Winery, Hill Top Berry Farm and Winery, Hunt’s Vineyard, The Winery at La Grange, and more. And after all of your wine tasting, you may be hungry for a bite to eat. The Wine and Craft Festival’s food vendors offers everything from the Urbanna Seafood Market and Raw Bar to Gabby’s Grub Globalized. 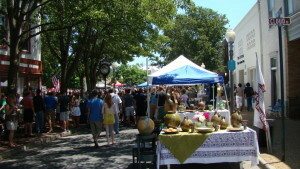 Besides the food and drink, the other part of the Virginia Wine and Craft festival surrounds local artisans. Need a gift for your hard-to-buy-for friend? Looking for a souvenir from your Virginia getaway? Maybe you’re simply in need of a new pair or earrings to decorate your lobes. You’ll find a myriad of beautifully handcrafted items right onsite at the festival. Click here for a list of participating crafters and artists. If you’re looking for nearby lodging, consider a Shenandoah Valley bed and breakfast!